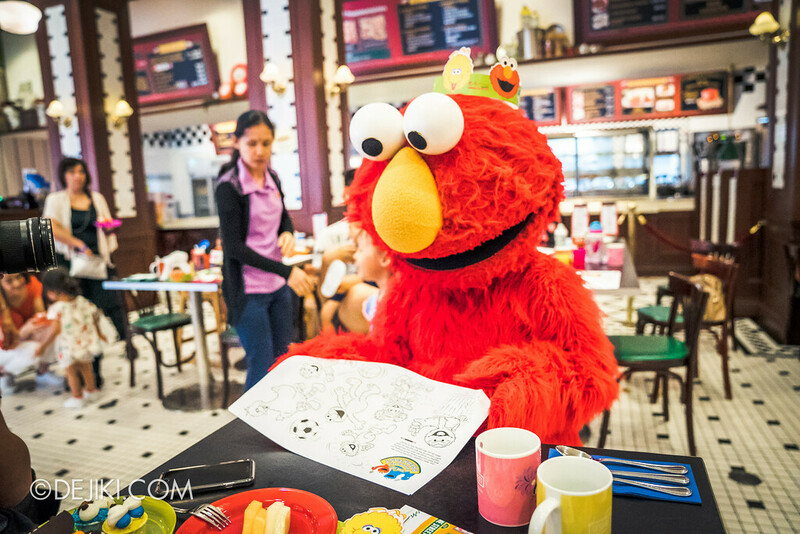 Sesame Street Character Breakfast is part of the Sesame Street experience at Universal Studios Singapore. 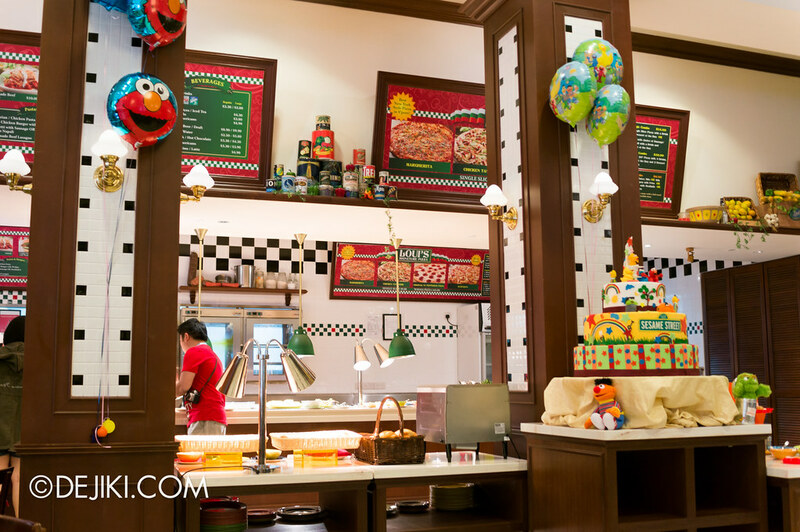 Available from late 2012, this premium add-on allows park guests to enjoy a hearty breakfast at Loui’s NY Pizza Parlor and meet characters from Sesame Street. This is different from the previous Breakfast with the Stars which was held at Mel’s Drive-In. Let’s have a tour of the experience! 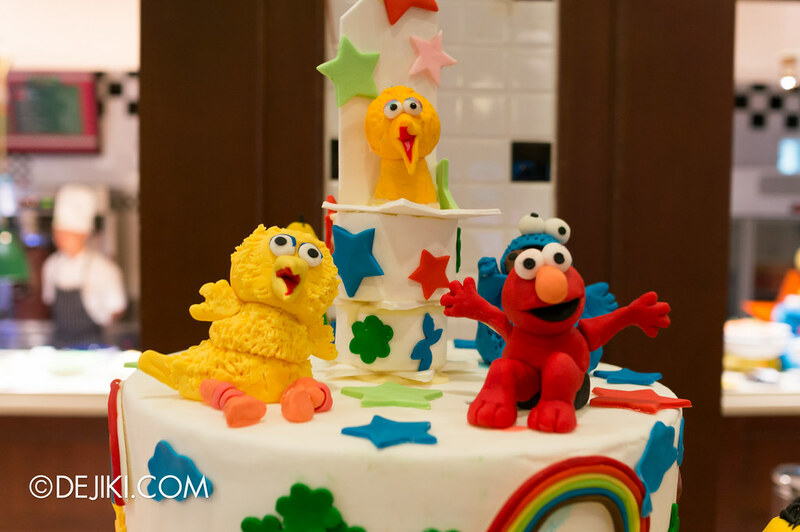 I have attended the Sesame Street Character Breakfast in Jan 2017, and the original article (below) no longer reflects the new experience that has taken effect from November 2016. 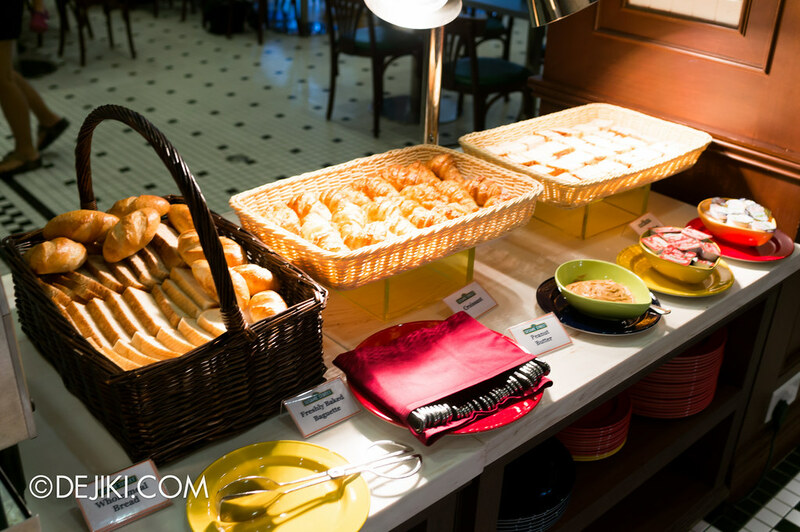 Notably, it is no longer a buffet and only fixed set meals are provided. Drinks are free-flow during the breakfast session. The usual character interaction is still there, and there are more activities to do. 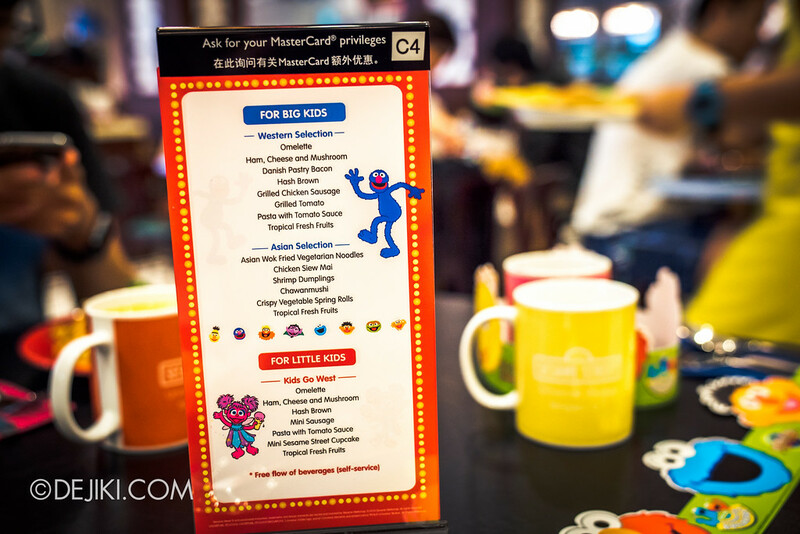 There is more interactivity in the updated version of the breakfast, including minigames, colouring activities and birthday treats for guests celebrating their birthdays. 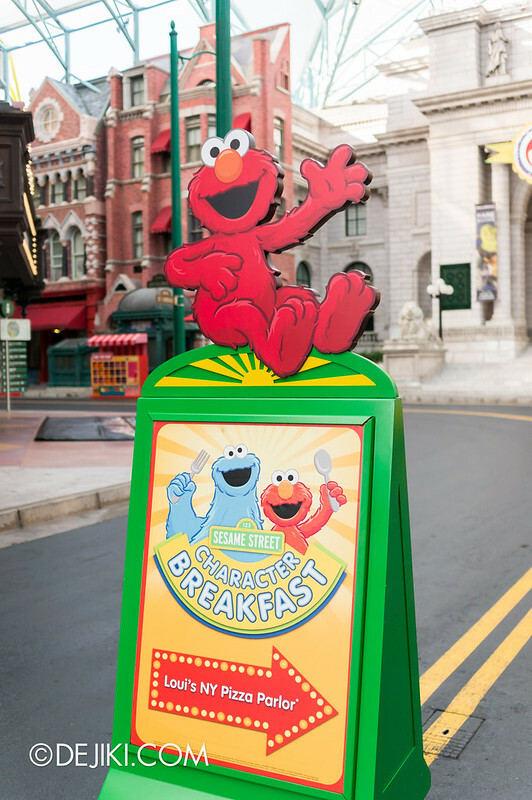 Breakfast guests get to enter the park from 9am. This is a very nice perk because guests get to see the operations crew getting the park ready for guests. And for an hour – the park is exclusively open for breakfast guests. Well, only the Hollywood and New York zones. Most breakfast guests would first notice this enormous display cake. 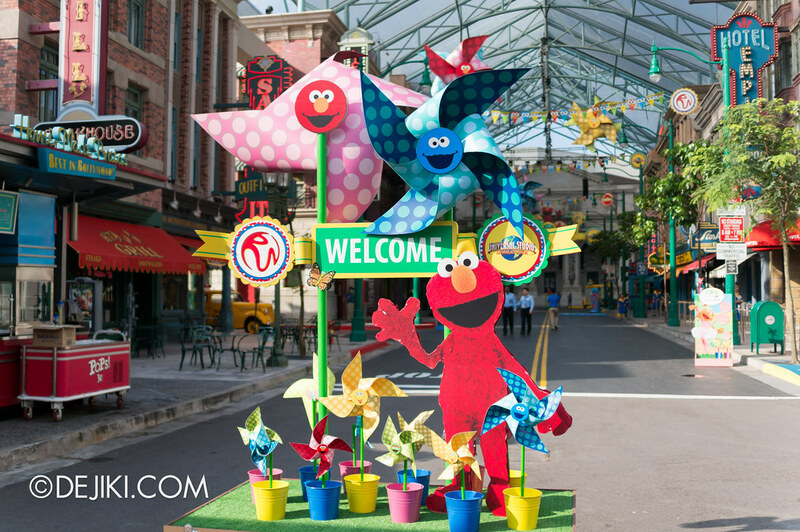 Sesame Street characters all over. Are they edible? We didn’t find out. 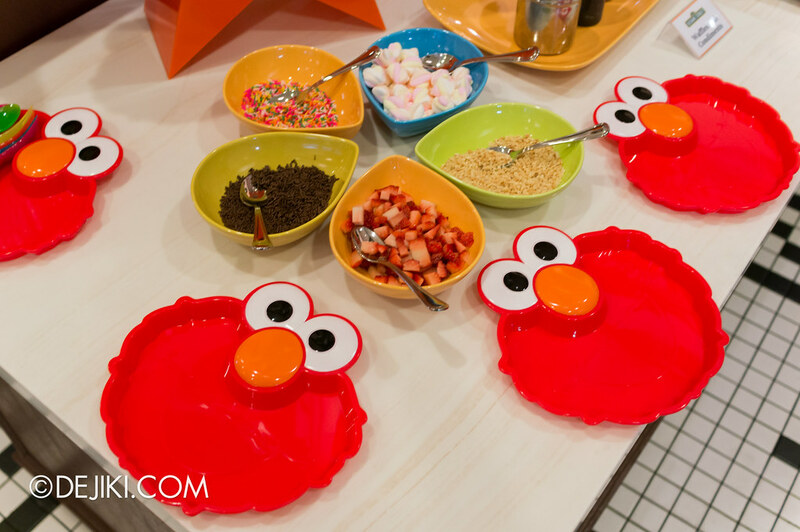 Kids would love these Elmo plates, given to all breakfast guests as a souvenir. 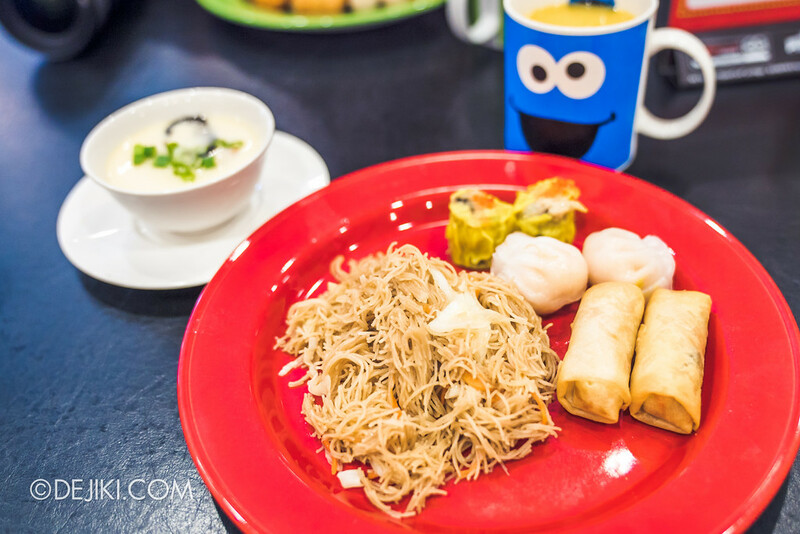 It’s mostly western fare, with some dim sum (shaumai and pau). 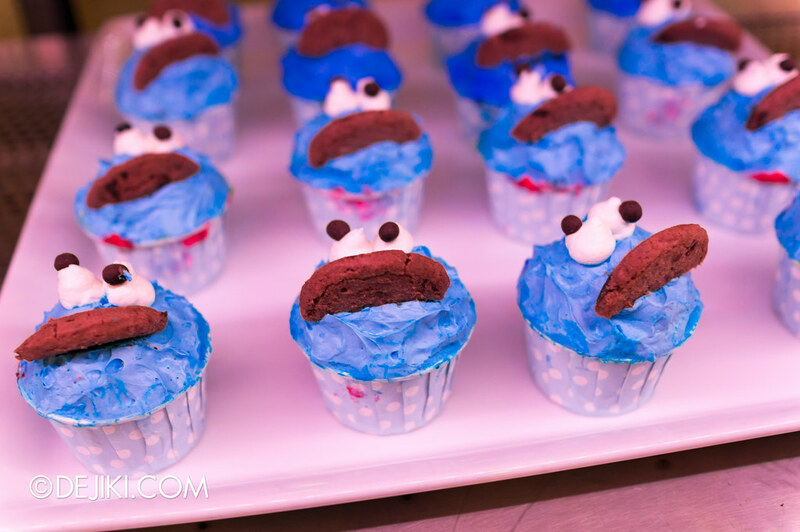 There’s a great assortment of cookies, cereal and sweet desserts. For the mains, standard breakfast fare of sausages, cold cuts, bread (toast and rolls) and waffles. 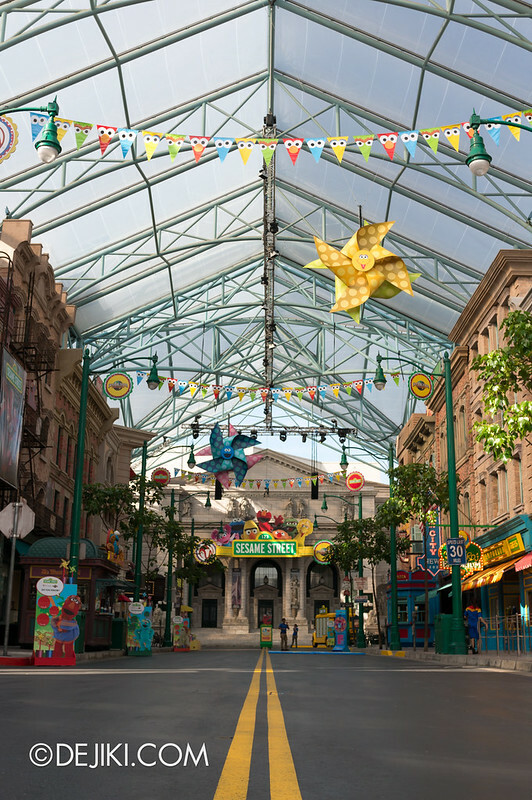 Spaghetti with meatballs is also served, linking to Sesame Street Spaghetti Space Chase. For beverages, there’s coffee, tea, fresh milk and orange juice. I’m quite surprised at the amount of sweet treats. So much sugary goodness for breakfast. You get the idea. 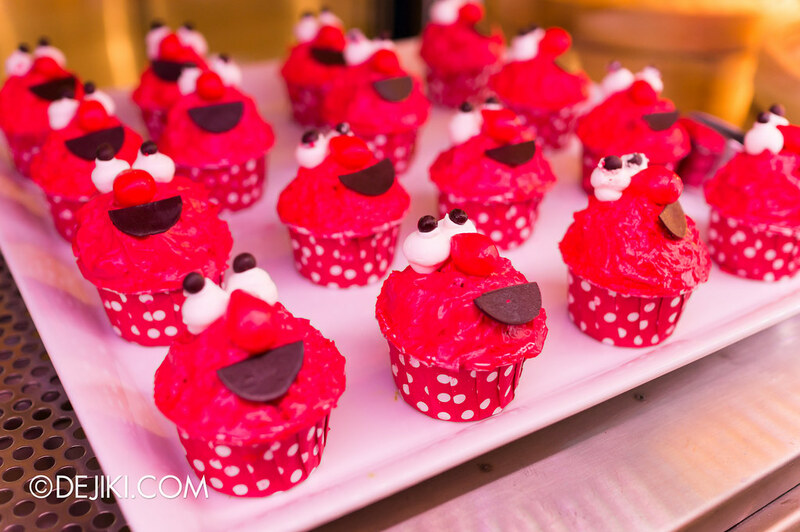 Many kids had plates FULL of cupcakes, cookies and brownies. I went straight to the salad station. 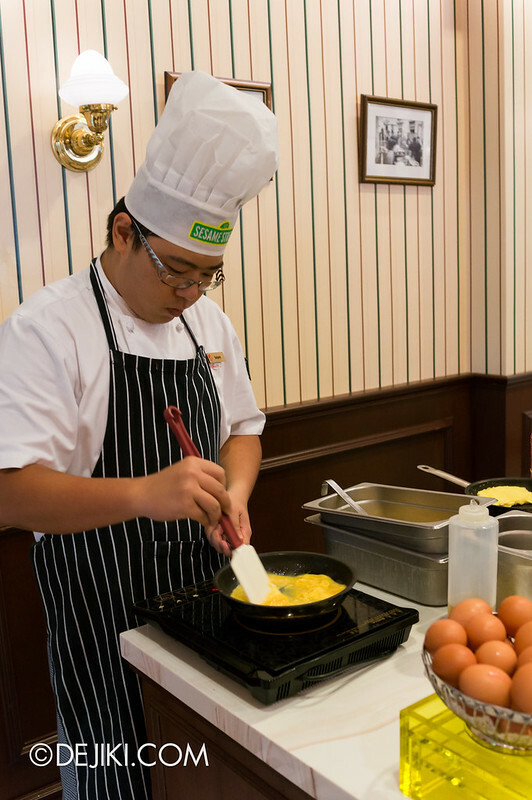 There’s of course, an omelette bar. Now then, what about the Sesame Street characters? Several characters appear during breakfast. 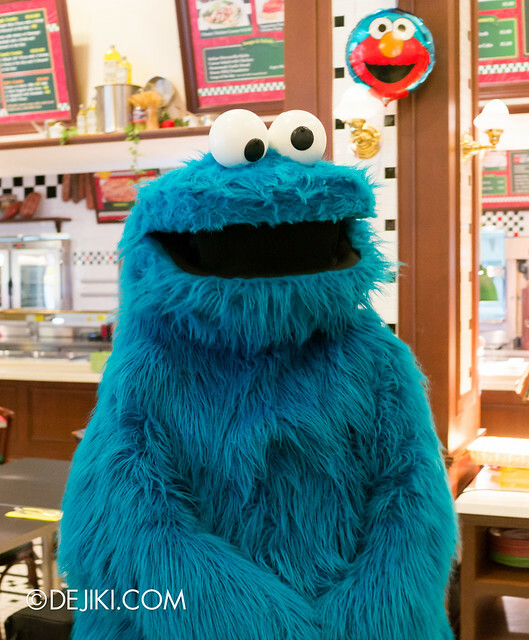 I’ve seen four: Cookie Monster, Abby, Elmo and Oscar. 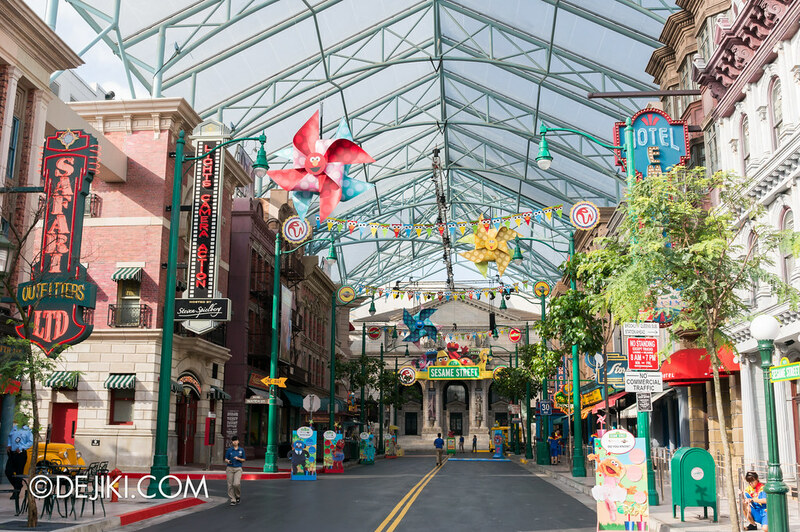 I found the characters to be quite disruptive because I’ve seen guests pausing their meals and making their way to characters the moment they walk into the restaurant. It can mean a very rushed and hectic breakfast experience. 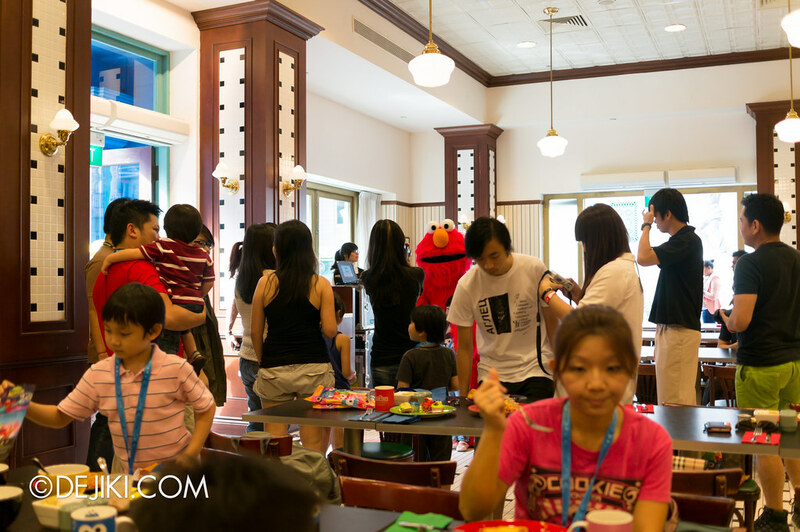 The children may be running to their favourite characters but right behind them: their parents with cameras. 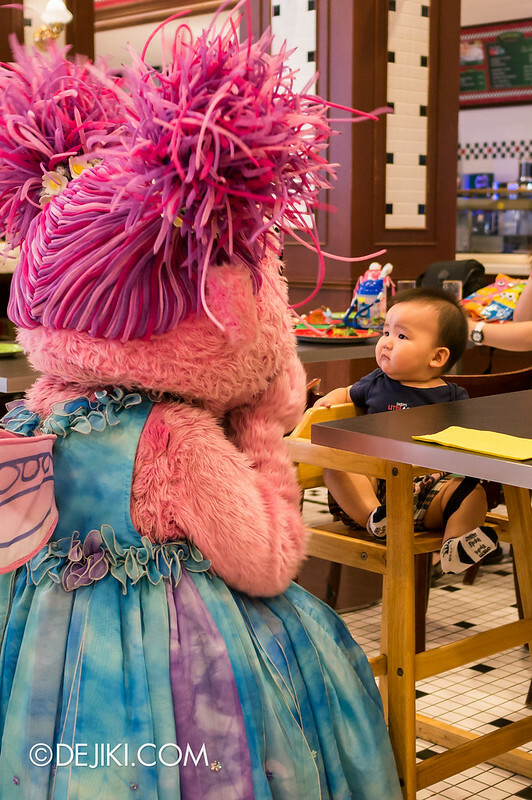 An adorable boy who is totally not amused by Abby Cadabby. 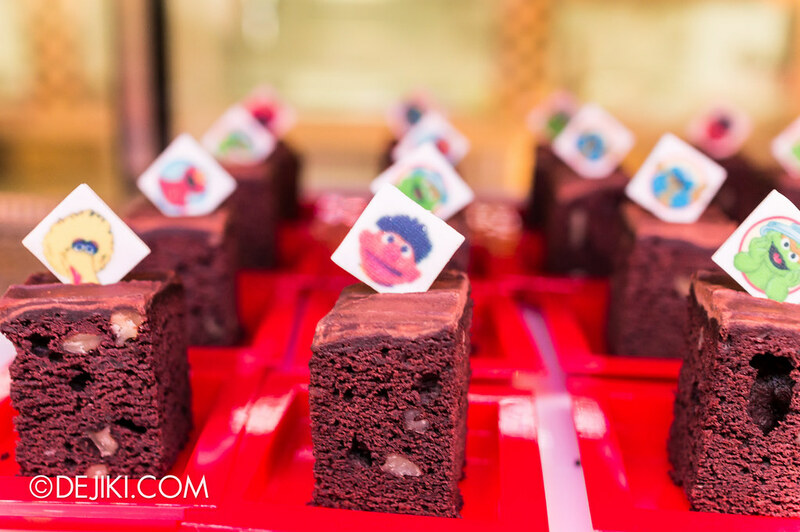 While an equally fulfilling (and much healthier) breakfast for the whole family costs a lot less, Sesame Street Character Breakfast offers a unique experience that will charm children and fans of Sesame Street. 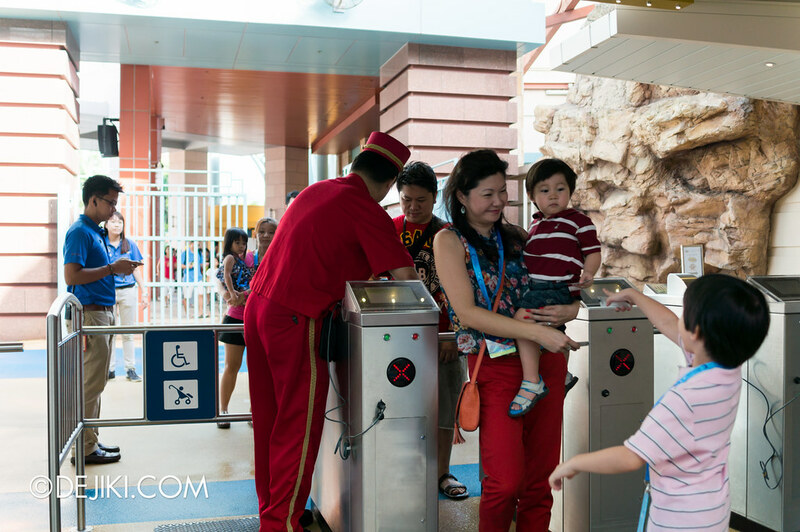 As the cost is rather high (imagine how much a family with a five would need to pay, on top of park admission), I would think that the experience will be reserved for special occasions, such as birthdays and celebrations. 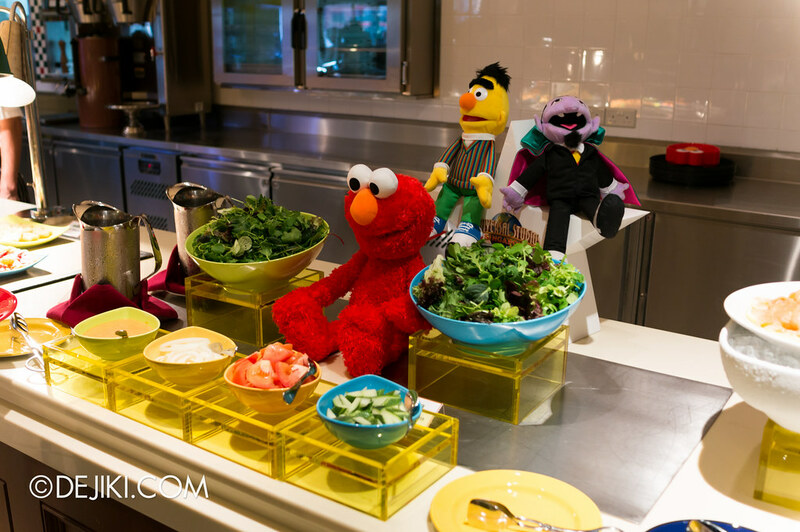 Breakfast guests enjoy a more exclusive time with characters (much shorter queue than the norm) and breakfast dining for two hours. 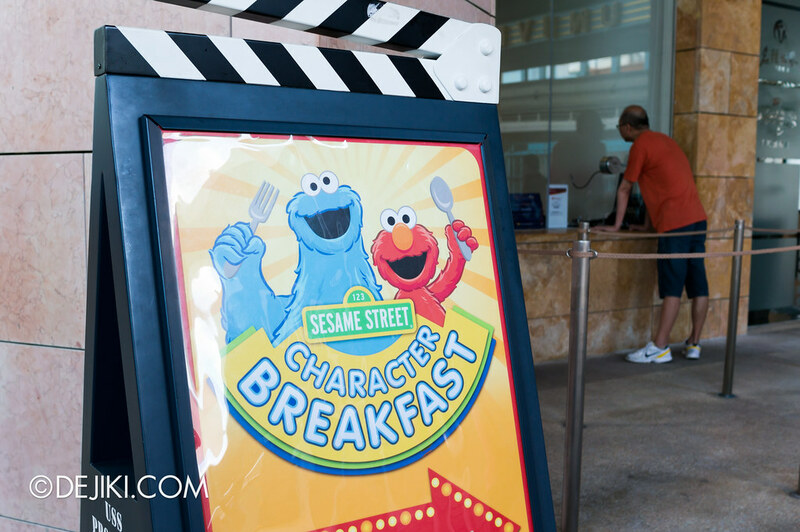 The wristbands given to breakfast guests offer Universal Express access to Sesame Street Spaghetti Space Chase in the morning, which is a great way to kick-start a day of adventure at Universal Studios Singapore. 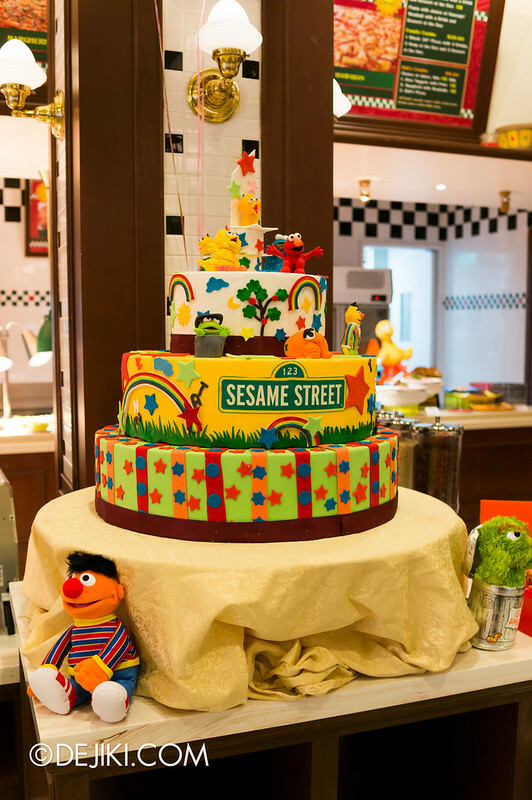 Sesame Street Character Breakfast is held on weekends and select holidays from 9:00am. At time of writing, this experience is available on Saturdays from now till 29 June 2013. 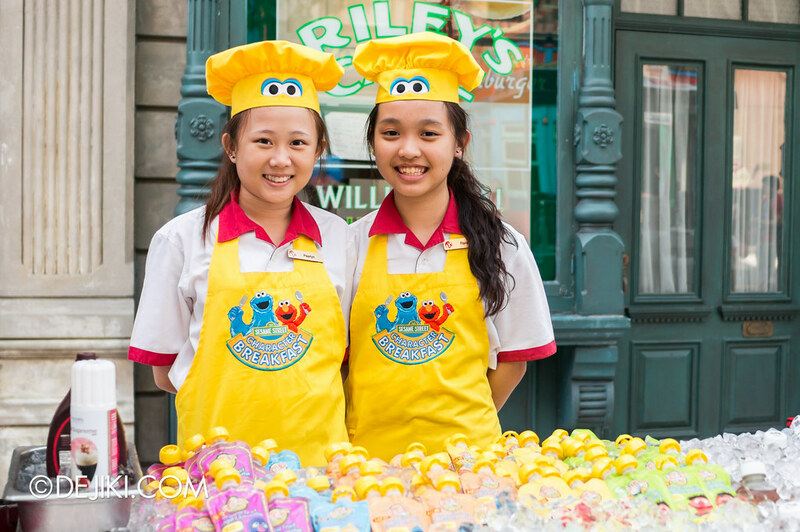 This premium experience is priced at S$44 per adult and S$32 per child. Advance reservations are required. 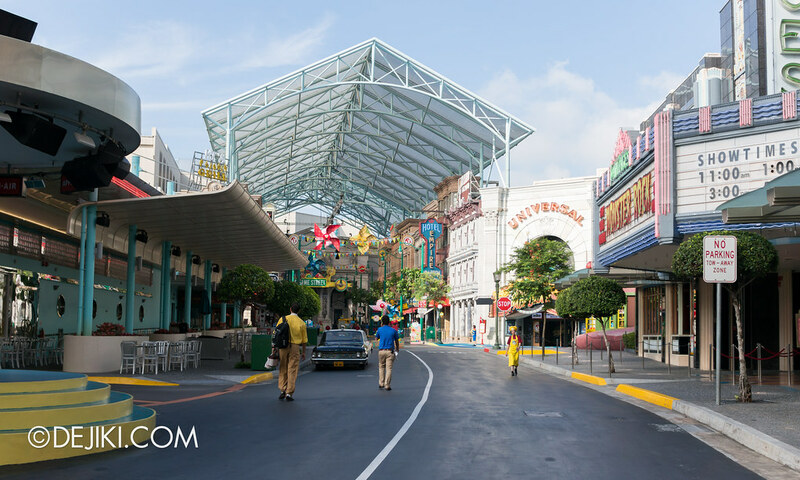 Character Breakfast does not include park admission, so guests participating in the character breakfast must have a valid admission passes to Universal Studios Singapore. 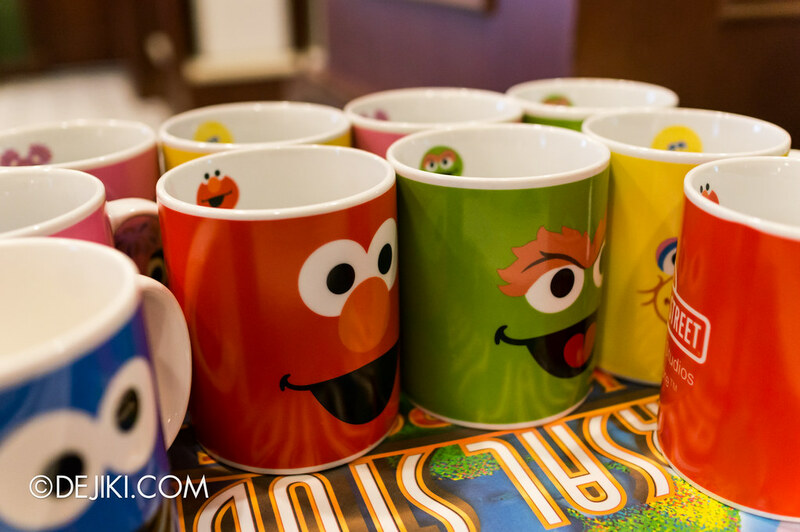 For more information and to make reservations, visit the official Character Breakfast page. Disclosure Dejiki.com was offered complimentary character breakfast at Universal Studios Singapore, courtesy of Resorts World at Sentosa. However, this has no influence on the opinions reflected in this review or related posts. Nice. 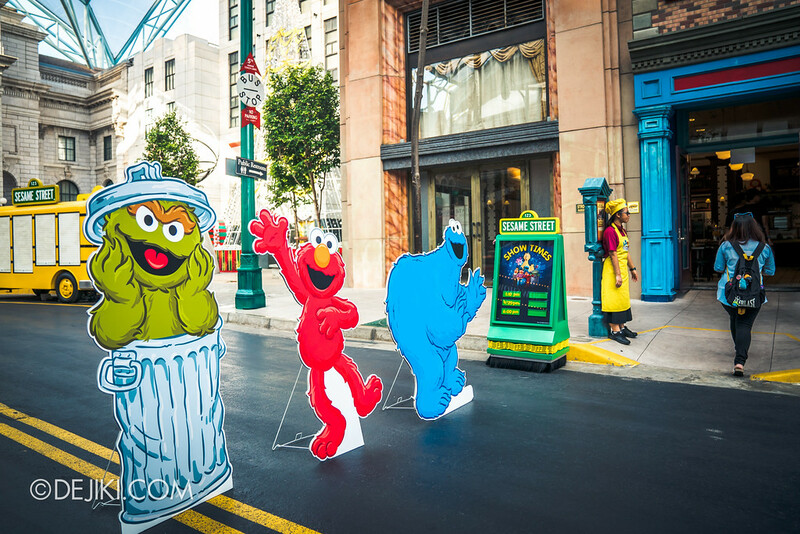 Breakfast with the Sesame Street characters must have been so fun. So what exactly was on the menu? Was it a good full breakfast? Also, I’m an ageing urm.. one year shy of 40years old adult male. How will that be so odd if I were to go for this breakfast, supposedly packed with children and their parents? While the restaurant was packed with children, there was quite a number of adults. I don’t think it’ll be odd, although the ambiance – full of screaming and shouting children – might be a disruptive breakfast for some (at least, that’s what I observed from the facial expressions of some adult guests). Buffet breakfast sounds nice. 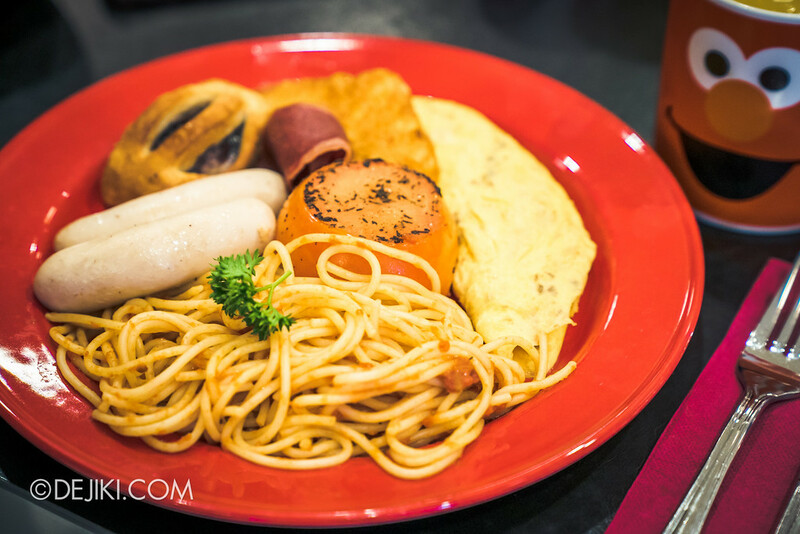 It’s not cheap, but the experience should be very different from other breakfast buffets that cost in the same region.